cyberREN is equipped with an advanced ordering facility which ensures the integrity of the patient care order, and that nursing staff are alerted and informed of new orders as required. All orders, including medication orders, lab requisitions and "generic" orders are handled consistently. Orders may be generated using Standard Protocols, each of which is a user definable collection of related, phased orders which may be carried out in a sequenced manner over the course of time. An order may be entered into the cyberREN system directly by a physician, or may be entered by another caregiver on the physician’s behalf. If not entered by a physician, then the order must be verified by the physician soon after the order was entered by proxy. When a physician logs on to cyberREN, he/she is automatically presented with all orders to be verified, written earlier on their verbal or handwritten instruction. The order is then processed, i.e. acknowledged by an authorized nurse and assigned to a caregiver. The caregiver subsequently completes the order on its start date, and the order is removed from the list of current orders. A standing order may be completed many times, and is deactivated only on its end date. 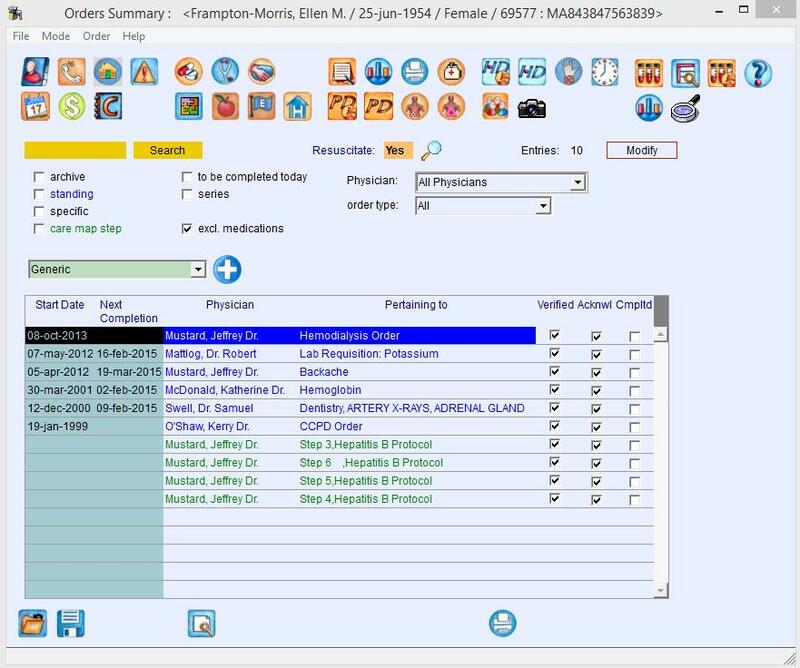 The existence of new patient orders is indicated at several points throughout the patient chart, for example as a patient alert presented in the dialysis session chart. New orders are therefore not to be missed.